Tate Modern pays tribute to Alighiero Boetti. David Franchi – Sunday, 8th April 2012. “Alighiero Boetti: Game Plan” is a major exhibition at Tate Modern about one of the most influential Italian artists of the twentieth century. This is the first large-scale retrospective about Alighiero Boetti’s work held outside Italy in over a decade. It highlights his often good-humoured exploration of numeric, linguistic and classificatory systems, as well as his commitment with Afghanistan. Boetti had from his youth deep and varied theoretical interests, studies and work experience on diverse topics such as economics, philosophy, alchemy and esoteric. The name of Alighiero Boetti – born 16th December 1940, Turin – is often associated to the Italian movement Arte Povera active in the 1960s, despite he dissociated in 1972. It could not be different as Boetti was a very independent figure. Arte Povera, or “poor art”, is a term – afterward widely spread by Italian art critic Germano Celant – indicating a group of artists that used objects made from everyday materials to produce pieces of art, including Giovanni Anselmo, Ferruccio Bortoluzzi, Pierpaolo Calzolari, Rossella Cosentino, Luciano Fabro, Piero Gilardi, Jannis Kounellis, Mario Merz, Marisa Merz, Giulio Paolini, Pino Pascali, Giuseppe Penone, Michelangelo Pistoletto, John Roloff, Gilberto Zorio, Helene Black, and Boetti himself. The Tate Modern exhibition displays early works of Boetti when he was involved with Arte Povera. From 1963 to 1965, Boetti began to create works out of unusual materials such as plaster, masonite, plexiglass, light and other industrial materials. In 1967 he had his first solo show at the gallery of Christian Stein in Turin (Italy) and participated to an Arte Povera group exhibition at Galleria La Bertesca in Genoa (Italy). Alighiero Boetti used typical Arte Povera artistic strategies. For example, the most modest of materials and techniques, challenging the so-called dignity of the art. The Tate Modern exhibition displays an amazing example of his Arte Povera work, the ‘Lampada annuale’ (Yearly Lamp) (1966), a single light bulb in a mirrored wooden box, which randomly switches itself on for eleven seconds only once a year. Nobody knows or can predict when the event will happen. Therefore this work focuses on the possibilities and limitations of opportunity as it is unlike that a viewer could be present at the moment of illumination. On show at “Alighiero Boetti: Game Plan”, the ‘Lavori postali’ (Postal Works, 1969) series, with which he started to inspire himself to the mathematical permutation for his works. By using an existing system (the post office), Boetti incorporated elements of casualty in his work. ‘Dossier Postale’ (1969-70) consists of a series of letters which were sent to 26 well-known friends, artists, art critics, dealers, and collectors. Boetti sent the envelopes to false addresses, therefore letters were returned to him undelivered, demonstrating his idea of improbability and chance. Alighiero Boetti worked with a wide array of materials, tools, and techniques, including ball pens (biro). The Tate Modern exhibition features several biro drawings in which Boetti’s favourite　phrases are encoded. Despite being commercialised in the 1940s, the popular use of the biro pen in Italy can be dated in the late 1950s, therefore as a medium was something relatively new in the country. Many of the works in this series contain puzzles, puns and linguistic codes, wherein letters of the alphabet proceed horizontally or vertically along the margin of the sheet. Boetti in the ‘lavori biro’ (ball pen paintings) asked to friends to fill large colored sections of work, typically alternating between a man and a woman. He made his first ballpoint ink drawings in 1972–73 and continued through the 1980s. On room 6, “Mettere al mondo il mondo”, on display is ‘I sei sensi’ (The Six Senses, 1973), part of a series of drawings done in code, where an alphabet is set up on the left side of the paper forming an index. It relates to the five senses in Italian – vista (vision), gusto (taste), tatto (touch), udito (hearing), olfatto (smell) – plus the one added by Boetti pensiero (thought). In the late 1960s Boetti also began to investigate the figure of the artist. The Tate Modern exhibition discloses his early scepticism about art movements through such works as his mock ‘Manifesto’ (1967) a poster listing the names of sixteen Italian artists connected to the Boetti background. Next to each name were up to four symbols out of a set of eight, the meanings of which is held secret but it had been recorded in a letter deposited with a notary. For all his life Boetti had a fascination with games, numbers, words, dates and sequences. “Alighiero Boetti: Game Plan” has a clear focus on it, underlined by such works as ‘Dama’ (1967), which show the illogicality using a chequer board pattern, and ‘Ordine e disordine’ (1973) a hundred multicoloured squares containing the repetion of the words ‘ordine e disordine’ dispersed on the wall or the series ‘Alternando da uno a cento e viceversa’ (1993). 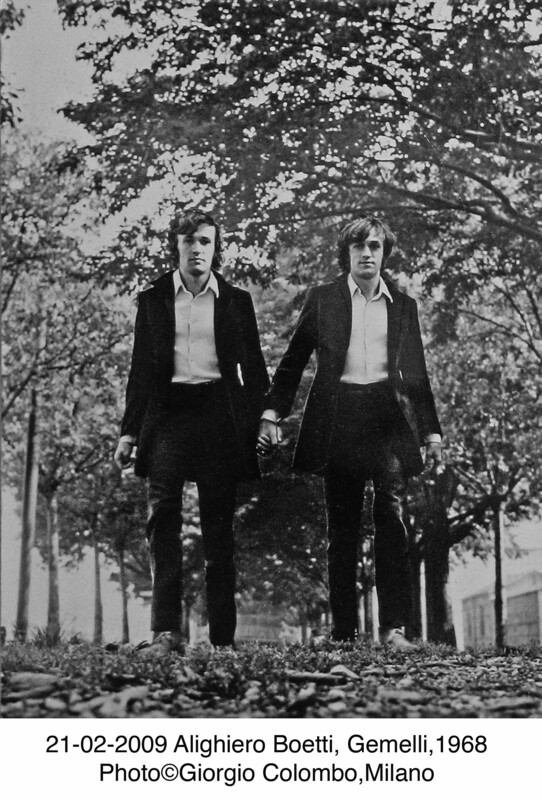 “Alighiero Boetti: Game Plan” displays a double-portrait postcard ‘I Gemelli’ (Twins, 1968), a photomontage where he appears like holding the hand of his identical twin. When in 1972 he split up with Arte Povera movement, he then moved to Rome. In 1973 he started to represent himself as a pair of twins and changed his name to ‘Alighiero E Boetti’ (Alighiero And Boetti) mirroring the contrasting elements present in his work: the individual and the society, error and perfection, order and disorder. Boetti was one of the first promoters of the idea of artist as part of a working group. He often produced an artwork concept but left its design and execution to others, recruiting other people to carry out the project. Nowadays this working style is very common. He often collaborated with others, both artists and non, giving them much freedom in their contributions. For example, one of the most famous works of Boetti is a wide production of embroideries of which a large selection is on display at the Tate Modern exhibition. 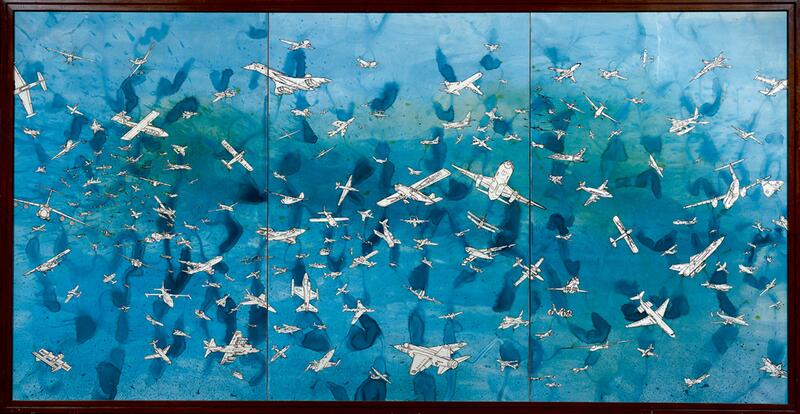 To create these works he collaborated with artisan embroiderers in Afghanistan and Pakistan. Aligiero Boetti was enthralled with Afghanistan since his travels to that country. After the Six-Day War (1967) he started to collect newspaper covers featuring maps of war zones and he asked his wife to embroider the shapes of them. The idea of the first large-scale embroideries was conceived during his second voyage to Afghanistan in 1971, resulting in a series of woven world maps entitled ‘Territori Occupati’ (Occupied Territories). Between 1971 and 1979 he set up in Kabul a sort of artistic commune the One Hotel with his friend and business partner Gholam Dastaghir. They created large colourful embroideries of which the most famous were the ‘Mappa’. In these world maps each country is coloured with its national flag, reflecting political changes across the world from 1971 to 1994. The embroidery of each map normally took one to two years. The exhibition also explores the ways in which Boetti worked with exiled Afghans during the years of the Soviet occupation. 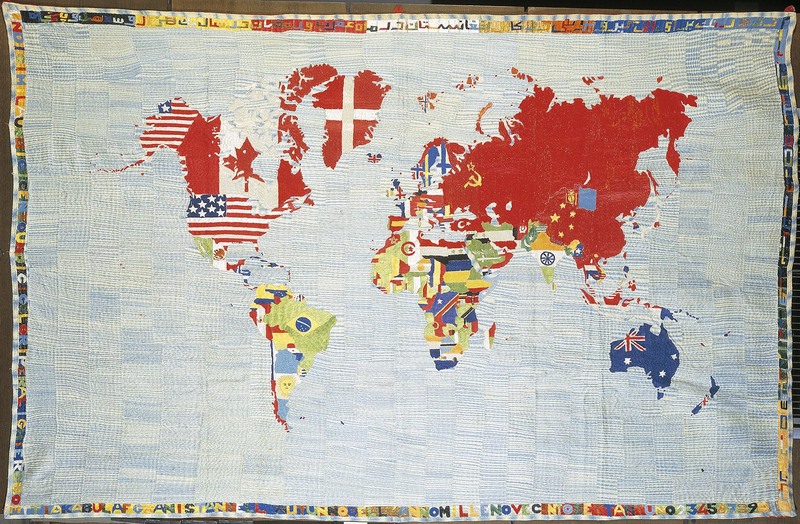 In 1971 Boetti commissioned the first map to the a women embroidery school in Kabul. He intended to make only one but nowadays about 150 can be counted and all of them with different dimensions. Embroidered by up to 500 artisans in Afghanistan and Pakistan, the maps were the result of a collaborative process leaving the design to the geopolitical realities of the time and the choice of colours to the embroiders. The Russian invasion of Afghanistan in 1979 moved the production from Kabul to Peshawar (Pakistan), where the group of Afghan women had taken refuge and where Boetti was only able to reconnect with them through middlemen. During the 1980s he visited Pakistan to meet the men organizing the embroidery. As a European male, however, he was not allowed to visit the camps. Therefore in 1990 he asked to Randi Malkin Steinberger to take photos of the craftswomen. At the Tate Modern on display ‘Classificazione dei mille fiumi piu lunghi del mondo’ (Classification of the thousand longest rivers in the world, 1977), his most challenging project of large embroidered piece. In typical block letters, this work lists the world’s 1,000 longest rivers in descending order of length. Known to many scientists as the “Boetti List”, it required more than seven years of research by Boetti and his first wife Anne Marie Sauzeau, an art critic. “Alighiero Boetti: Game Plan” also explores his collaborations with young people, including jigsaws based on watercolour paintings of aeroplanes, counting books made with his daughter, and grids of faces which were completed by children the most famous of which is the series ‘Aerei’ (Aereoplanes). On the Tate Modern balcony, the exhibition includes the late ‘Autoritratto’ (Self-Portrait, 1993), a life-size bronze cast of the artist spraying his heated head with a hose that transforms water in steam, never seen before in the UK. This work was made before his death occurred the 24th February 1994. Supported by The Alighiero Boetti Exhibition Supporters Group, Tate International Council and the Tate Patrons. Alighiero Boetti: Game Plan is curated at Tate Modern by Mark Godfrey, Curator, Tate Modern with Kasia Redzisz, Assistant Curator, Tate Modern. This exhibition is co-organised by Tate Modern, the Museo Nacional Centro de Arte Reina Sofía, Madrid, where it was shown from 5 October 2011 to 5 February 2012, and The Museum of Modern Art, New York, where it will travel in summer 2012. From 28th February until 27th May 2012. At the Tate Modern, Southbank, London. « “Premiums Interim Objects” the student exhibition of the Royal Academy of Arts.